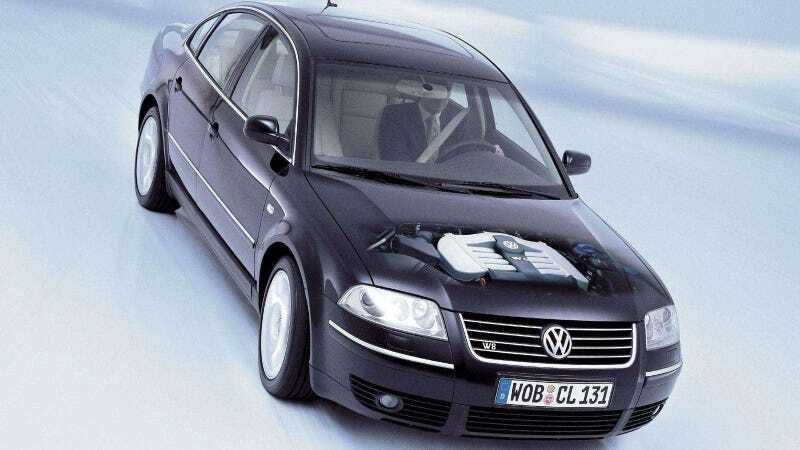 I don’t know if the W8 Passat was as unreliable as everyone remembers it to be, or if it was only that people who expected something approaching Camry-grade reliability from what was a reasonably exotic vehicle got loudly turned off by it. But I just know some of you out there have owned these things. Again, the W8 Passat is kind of a pinnacle wait why did they build that kind of car. A V8 Passat would have been weird enough. A W8 Passat was extra strange. And you could get it with a manual and all-wheel drive and in a wagon. That’s a lot checked off on the imaginary Unexpectedly Cool Car Checklist (UCCC). The B5 generation Passat also finds its way burrowing into my brain-holes because it’s a handsome car. The siren song is loud, though its exhaust restrained. Like the rest of VW’s production W-engine family (though VAG experimented with other designs), the engine is basically two banks of VR engines. In the Passat’s case, effectively two VR4s enmeshed for 4.0 liters, 270 horsepower at 6000 RPM, and a 273 lb-ft of torque at 2,750. These cars were odd enough that I assume all records of their “usual problems” have been scrubbed from the internet and put in car reliability jail, for fear that their evil words might leak out of your computer screen and hop into your car’s ECU, immediately throwing a check engine light. But again, I really don’t know if these cars were as bad as everyone thinks they are, or if the big problems come down to parts availability, or if there is one blessed W8 owner among you who has never had an issue because you dutifully respected every suggested maintenance schedule and so regularly call Wolfsburg they just start telling you how their day is going over there. If you have owned one of these cars, let us know in the comments below. Remember to post a picture of it, too!